Mind Flayer is an Enemy in Demon's Souls. 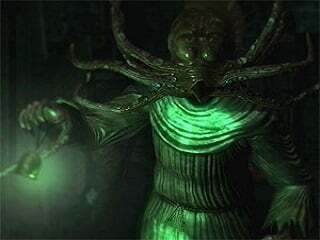 Mind flayers are octopus-headed mages who serve as the prison guards in the Tower of Latria. They are powerful spell casters, who were able to overwhelm and imprison Sage Freke. Presumably under servitude of the Old Monk, they inflict horrific punishment upon trespassers and escapees of the tower. Presumably, they were among the demons that the Old Monk brought with him upon his vengeful return to Latria. At close range - release a green energy ball which causes paralysis, followed by a tentacle stab for heavy damage. Casts a sonic boom for heavy damage. This is not proximity dependant, but does tend to follow a tentacle stab. They're easy to spot as they glow and carry a distinctive bell. This bell seems to alert the other guards, who will attack if they are nearby. These guys tend to kill new players with magic. If you make a direct frontal attack, they will stun you with their magic. Only a shield that blocks magical attacks will be effective. So, how to beat them? Fighting magic with magic works fairly well; if they rush you, just keep casting from behind them and they'll drop quick enough (fire magic really messes them up). You can also equip the Thief's Ring and stab them in the back for a critical strike. Try using a bow at long range as well, just be ready to dodge their magic spells.